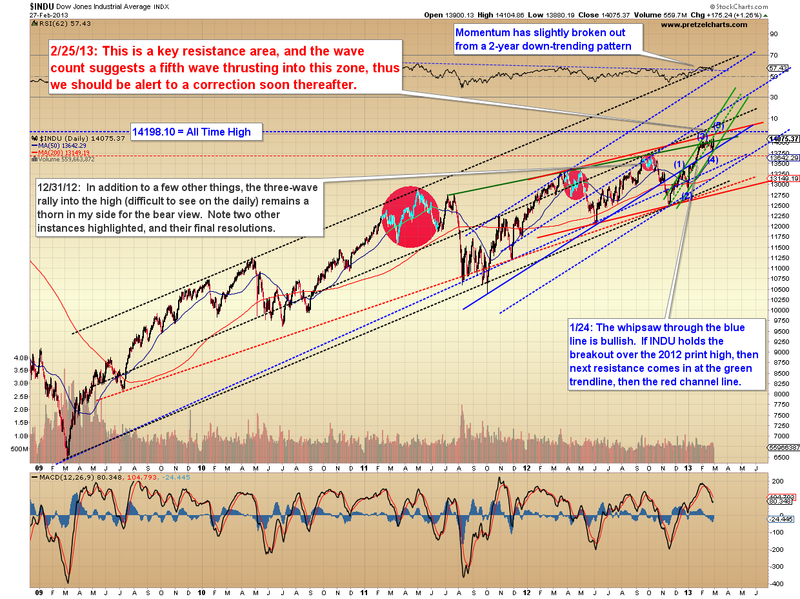 Pretzel Logic's Market Charts and Analysis: SPX, INDU, BKX: Can We Draw a Conclusion from Three Fractured Markets? SPX, INDU, BKX: Can We Draw a Conclusion from Three Fractured Markets? Long-time readers will recall that I've written about fourth waves as my arch-nemesis, and the current market hasn't disappointed me in that sense. The market has been whipsaw city for the past few sessions, and this is typical behavior for a fourth wave -- which is one of the reasons I despise them, and generally simply avoid trading them except for very low-risk entries that I'm often quick to exit. While it's tempting to look at yesterday's rally as the "all clear" for the bulls to proceed into a fifth wave rally, I would simply caution that price is still within the fourth wave trading range, and fourth waves are almost never as straightforward as they appear at first (or second... or third...) glance. 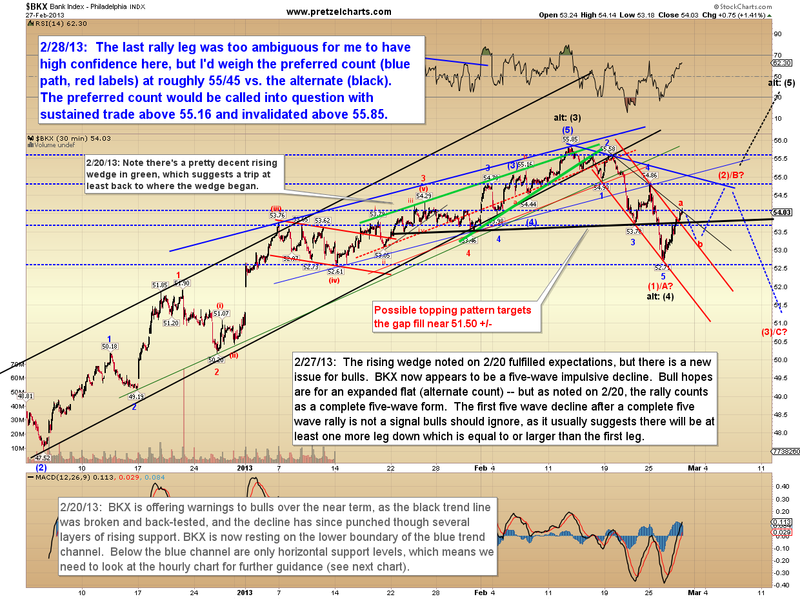 Further, we are presently seeing some fracturing across markets. Yesterday, I called attention to the Philadelphia Bank Index (BKX), which appears to have formed an impulsive five-wave decline. This is a tricky one, though, because the preceding move was a mess, and so the impulsive decline could conceivably be the c-wave of an expanded flat correction ("alt: (4)" label). However, I presently do not believe that's the case; I'm more inclined to view that decline as a first wave down ("(1)/A" label), and am not yet convinced the correction there is over. 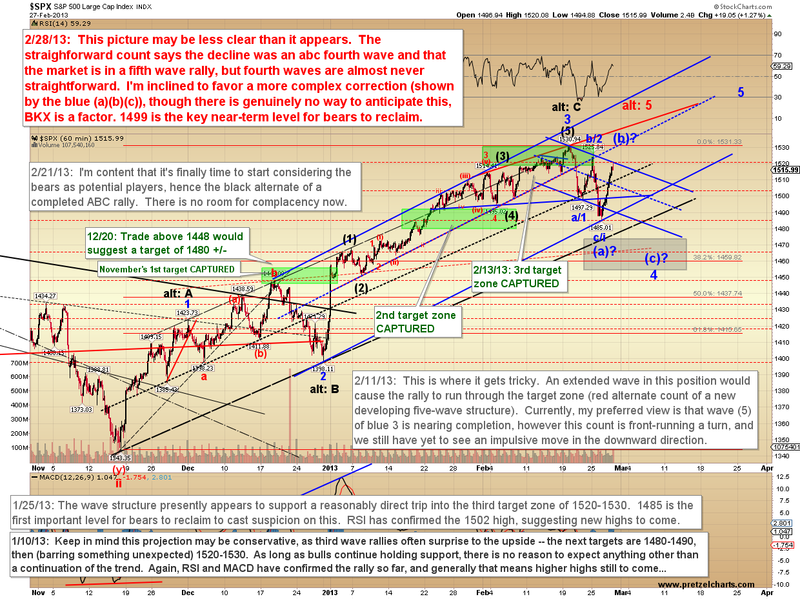 That leads me to a more complex count in the S&P 500 (SPX), which I'll share momentarily. Further, note how much BKX is lagging SPX in price, and that's often not a good sign for SPX. As long as this fracture between markets continues, it's more likely that BKX will ultimately win that battle and drag SPX lower, as opposed to vice-versa. The bottom line here is that I'm inclined to believe that BKX will see lower prices before it sees new highs, and that suggests SPX will be struggling uphill for the time being. We'll watch this carefully going forward for signals which either validate the rally in BKX as corrective, or which suggest that rally is becoming impulsive in nature. The impulsive decline in BKX leads me to believe that one of two outcomes awaits SPX. The first option is that the current correction will become more complex in nature (blue 4 below). 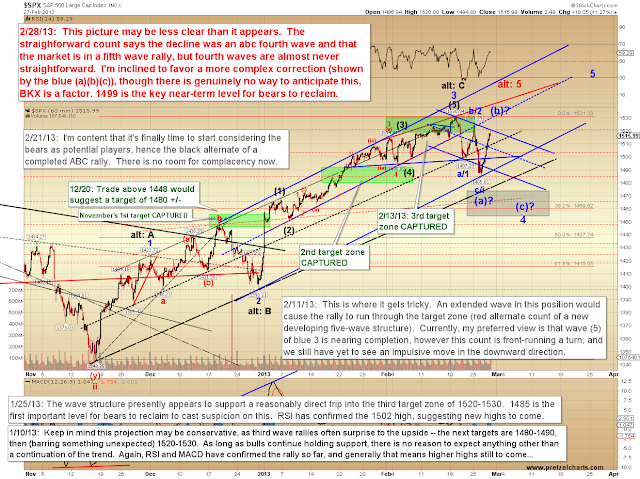 The second option is that SPX will make a new high for wave 5, but that it won't be significant (red "alt: 5"). I would like to caveat that I'm front-running the market with this conjecture, and the intermediate trend is still clearly up -- so play along at your own risk. Another market which has now gone its own way is the Dow Jones Industrial Average (INDU). 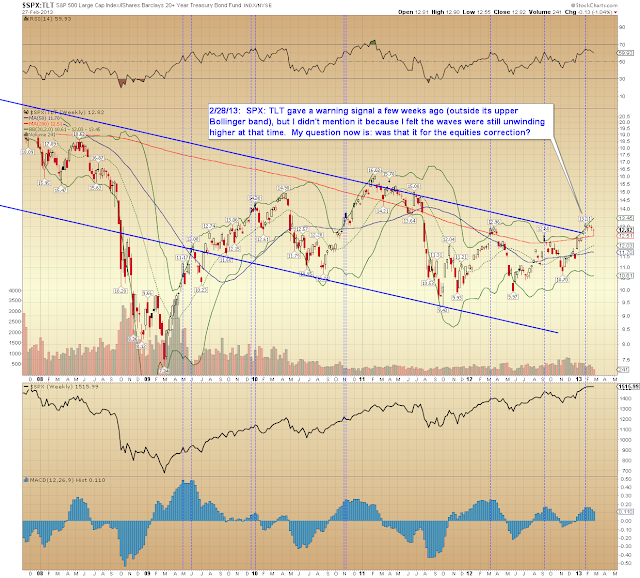 INDU made a new high yesterday, and SPX often follows suit. So we have BKX, SPX, and INDU each doing their own thing. SPX presently seems to fall right in the middle of the two, so hence my conjecture that a retest or marginal new high followed by a decent reversal is in the cards. 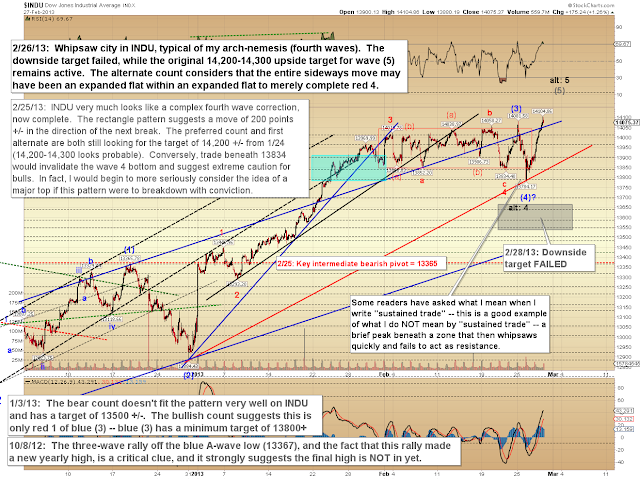 This proposal actually matches the INDU count quite well, as the present rally leg does appear to be the final fifth wave in INDU's series. 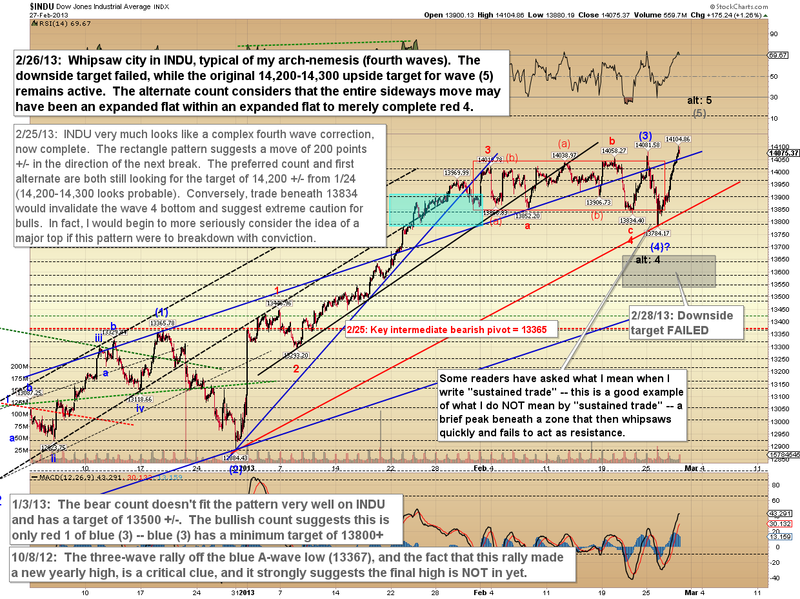 INDU's rally is presently corrective (an ABC), and has not yet formed five waves at micro degree. 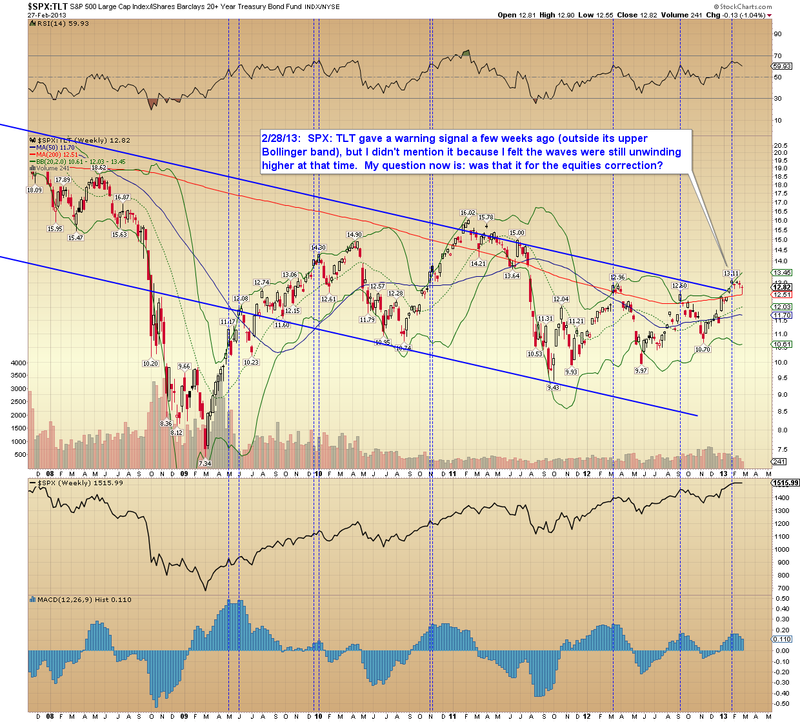 The long-term INDU chart notes the approach of the previous all-time-high. If INDU clears 14,200, then there is simply nothing left as far as horizontal resistance, so we have to watch theoretical overhead resistance levels in the form of trend lines/channels, etc.. In conclusion, I may be a little early warning about these signals, since it's entirely possible that a fifth wave rally is underway in SPX and that will take us up to new highs rather directly. However, I wanted to emphasize that things are not as clear-cut as they may appear. Ideally, one or more of these signals will clarify in the next few sessions. Trade safe.